Our Last Trip – Bishops Storford 2 Dorchester Town 0 – 19th September 2009 So five weeks after the start of the 2009/10 Premier League season I had the chance to see my first Hammers game. “Unloyal supporter” some of you may chant, but during that period where I had actually seen ten games around Europe West Ham have only played at home in the Premier League once! The game versus Spurs which was moved due to TV clashed with my flights over to Denmark so I had to miss the game (and the Millwall riot too) against our bitter rivals. In that five weeks we had played away on three occasions, and had three international games – brilliant scheduling….and talking of scheduling lets give Transport for London three cheers for chosing this Saturday to do engineering works on the two lines that run to Upton Park and thus no tubes would run close to the ground. Their advice was comprehensive – train to Barking or Forest Gate and then either a 45 minute walk (but they would be putting up extra signs for us bless) or local buses – now they would be run to get on after the game! Lolly and I had been handed a Danny Last Golden Ticket (see his blog for some examples of how he manages to sneak a game in at every opportunity). The West Ham game was not due to start until 5.30pm with Liverpool (TV again!) so we had a chance to get in a 3pm local game….Littlest Fuller was off to Rainbow Roundup at a local E-Coli(we hope) free petting farm, which meant CMF had the day to herself and was treating herself to a day at Ikea. So out came the Famous Fuller Crystal Ball….tempting was the return of the legend that is Julian Dicks at Grays Athletic but I fancied continuing my run of Blue Square South games, and so the mist cleared and we saw Bishops Stortford. Just up M11, only 20 miles and (in theory) 25 minutes from Upton Park, we would have time to see 75 minutes or so of their game with Dorchester Town before heading south. 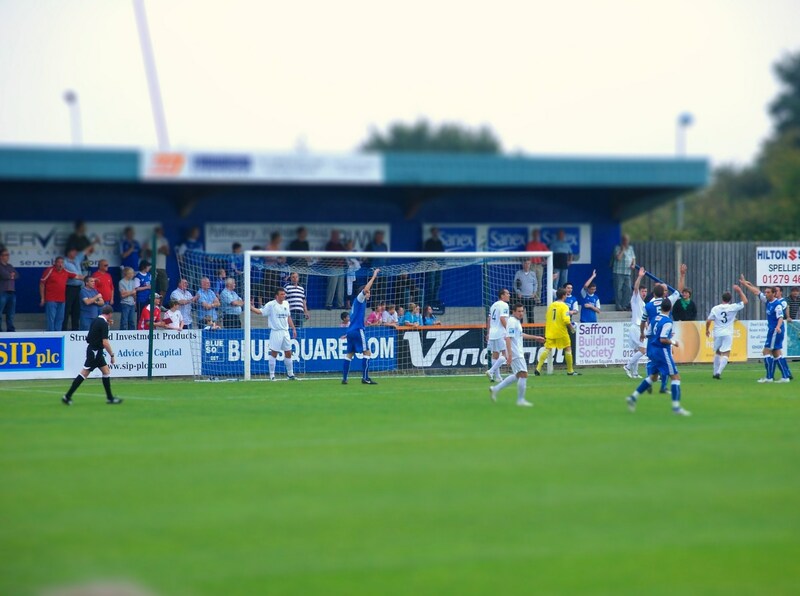 I was keen on this one as goals had certainly been on the agenda at Woodside Park recently – twelve in the past three games including the 5-1 defeat to Bath City. They also had Charlie Sheringham, son of Teddy, leading the line, and he was the leading scorer in the Blue Square South with nine goals so far, including five against Weymouth and a hatrick away at Hampton & Richmond. In keeping with the theme of the day, Woodside Park is also the venue of West Ham United’s reserve team this season. Now there’s an interesting topic. Reserve team football. 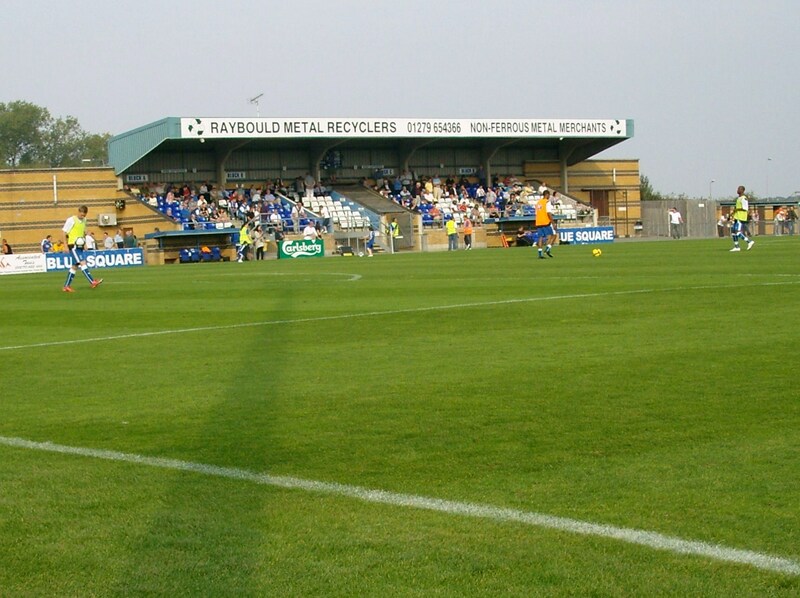 West Ham had certainly shared around these games in the past using Leyton Orient’s Matchroom stadium, Southend’s Roots Hall, Dagenham & Redbridge’s Victoria Road and Grays Athletic in the past. This season, with more emphasis being put onto the Premier Reserve League the club had done a deal to play in Hertfordshire. Crowds rarely reach three figures despite the quality of some of the players on show. West Ham’s first reserve home game this season, the 6-0 demolition of Birmingham City (at Upton Park) had seen new signings Alessando Diamanti, Manuel Da Costa and Franck Nouble, returning from injury Valon Behrami plus promising youngsters Josh Payne, Zavron Hines and Anthony Edgar…oh and Nigel Quashie! So anyway, back to Bishops Stortford. 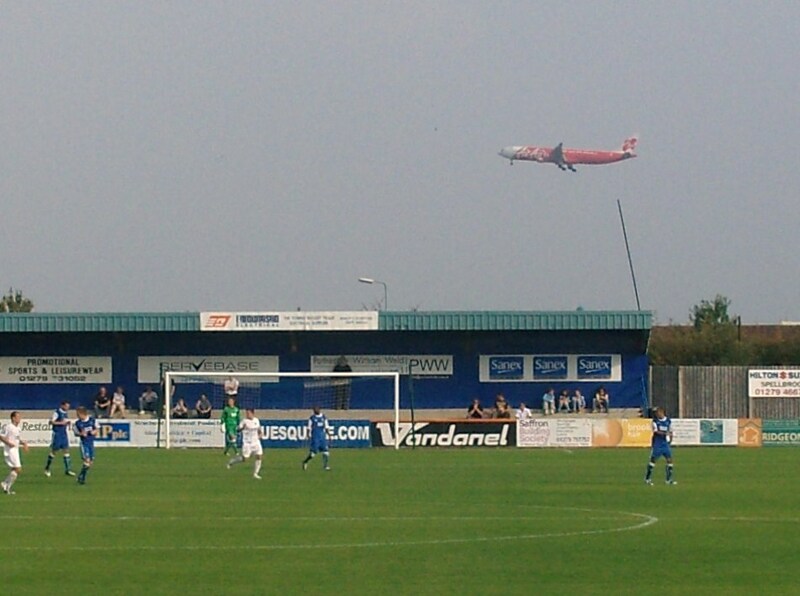 The neat little Woodside Park stadium (capacity 4,000) sits almost at the end of Stansted Airport’s runway, separated by a golf course and the M11. It is one of the simplest grounds at this level to find – turn left at junction 8 of the M11, past Welcome Break and take 1st right and there you are. What else can I tell you about the club? Members of the Blue Square South since 2004, and almost reaching the Premier in 2007 but lost in the play offs to Salisbury City. Average crowd of around 4,000 and local rivals are Braintree who are a dozen miles straight down the A120. Last season they finished in 9th place and Lewis Smith was top scorer with 12 goals, only 3 more than young Mr Sheringham has already! Two other notable facts for you…. 1. Bishops Stortford played the last “association football league” match of the 20th century when on the 30th December 1999 they beat Chertsey Town 5-3. 2. The club were the last winners of the FA Amateur Cup, joining such esteemed yet now unknown clubs such as Old Carthusians, South Bank, Crook Town, London Caledonians and Middlesborough, in 1974 at Wembley Stadium when they beat Ilford 4-1. After the game the FA decided that the term “amateur” no longer applied to football and took away the trophy in a paddy. Dorchester Town were the opposition for this one, themselves floating around the bottom of the table, and arriving with five defeats in a row on the road, shipping in sixteen goals in the process. So two teams that liked to concede goals – surely this had a nil nil draw written all over it! Another easy journey saw us park up in the car park within 45 minutes of leaving home. A bargain £10 for the two of us, £2 for a programme, £3.60 for two Hot Dogs, £4.00 for a couple of drinks and our customary golden goal tickets (17 and 62 today) beats our £20 budget from last week’s game, again underlining the difference in value in watching football a few divisions lower than the Premier. The only disappointing element for the club must be the attendance – 401, including a visit from Sir Edward of Sheringham, there to see his Charlie (not the same Charlie that everyone seems to be looking for in Amsterdam). It’s a nice neat stadium, perfect for football at this level. The club have those pop up sprinklers which before the game liberally watered the grass. A great idea, but in this case they seemed to spray water over the terraces rather than the goal mouth. That’s fine for those fans in the know, but for fans on their first visit who are busy having a beer and reading the programme it is not so good as I got soaked, much to the amusement of the few fans who were around me (including Lolly). Stortford always looked like the form team. Brayley and Sheringham created early chances before the latter smashed the ball home from 10 yards after an excellent knock down. They then looked to double the lead with the lively Ashley Nicholls creating chances for Bowditch and Sheringham. 1-0 wasn’t a fair reflection on the game but at the end of the day 3 points were the main objective. The second half started slowly, with most of the ball failing to leave the midfield. Dorchester started to come back into the game and they were unlucky not to equalise when a Bishop’s Stortford defender nearly diverted a cross into his own net. The game was competitive but never malicious so it was amazing that the referee decided to send off Dorchester’s Vickers after a mild disagreement with a Stortford player in the penalty area after a free kick had been awarded. One can only think it was for foul and abusive language because most fans could see no other reason. The second goal for Stortford sealed the match and caused us to run back (well stride) into the ground as we were leaving, when substitute Duane Jackman followed in a loose ball in the penalty area. So 2-0, a third consecutive win for the Blues and we were on our way south.